Swivl is used for a range of activities in over 40,000 schools around the world. Secondary markers record audio of the students AND live stream to the teacher for real-time adjustments in the classroom. Remote Coaches provide in-ear feedback while watching video of the teacher. Use your favorite video streaming app like Zoom. Swivl is a powerful tool that allows teachers to be creative, provide engagement opportunities, and create endless learning possibilities. As a special education teacher who has students reflect on elements of their presentations such as body language and clarity of speech, Swivl allows my students to receive feedback immediately by reviewing their presentations. Swivl is helping our students develop 21st century learning skills that are essential for success. I am convinced that videos are productive tools to enhance teachers’ professional development and students’ achievement. 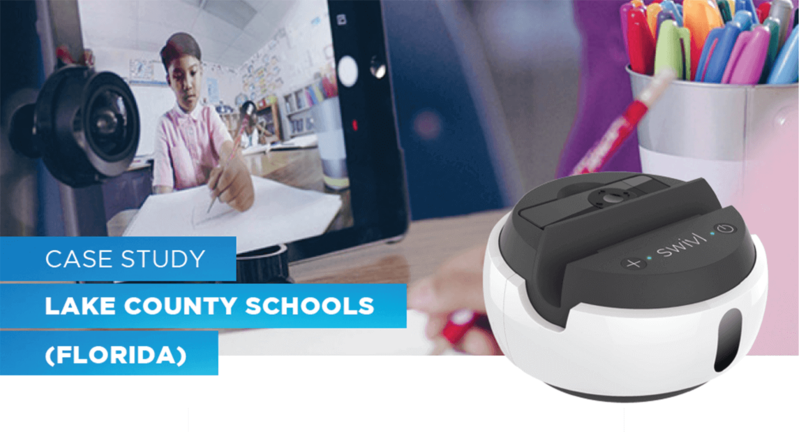 The Swivl robot’s ability to navigate with the teacher’s movement make it easy to get the full picture of what is happening in the classroom. Swivl follows the teacher for automated lecture capture. Record student projects for in-class presentations and evaluations. Distance learning for homebound or remote students. Use Swivl to perform unbiased formative assessments for new or current teachers. When connected to a speaker, Swivl uses the teacher microphone to project classroom audio. Upload, annotate and dialogue with students about any video content, not just your own. Our team of specialists is ready to help you evaluate the tools you need.